Members of the National Union of Journalists in Leeds have marked the 50th anniversary of journalist and activist, Pete Lazenby. Described by union president, Tim Dawson, as the “Leeds dissenter”, Lazenby has worked throughout his career in Yorkshire. “With his ornate moustache and flat vowels, Pete Lazenby is well known activist throughout the NUJ. He has been a stalwart of collective action, however his greatest achievement was as joint father of chapel, maintaining union organisation at the Yorkshire Post/Yorkshire Evening Post through the dark days of de-recognition. He has also been a well-spring of newsroom common sense in many of our internal debates,” said Tim Dawson. Starting out as a teenager on the Wharfedale and Airedale Observer, he then moved to the Yorkshire Evening Post, where he spent 40 years. During that time he covered the miners’ strike and investigated the far right - reports that led to death threats. He was also father of the chapel at the YEP. 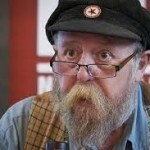 Leaving in 2012, he has since covered the North of England for the Morning Star. “I started writing when I was nine or 10 years old – essays, made-up stories, all sorts. I enjoyed it, like a hobby. Then when I got to 17 and was ready to leave school – wonder of wonders! Joy of joys! I discovered that people were actually prepared to pay me to enjoy myself! “And there was the union of course, the NUJ. I really do love my union, and the people who make it work, generation after generation, new activists coming through, carrying on the struggles, not just for decent wages, but for the truth, resisting greedy, rapacious, corrupt media moguls determined to feed millions of readers nothing but a combination of lies and titillation.